Training Day 3 was an exciting day for the crew…it was time to put classroom training to the test as the Aquanauts proved that they could complete equipment setup, checkouts, and dives with the Superlite helmet and equipment. They teamed up (Chris and Steve, Tom and Andrew) and worked through their procedures to practice the very tasks that they will need to complete each day when they conduct their underwater extravehicular activities (EVAs). 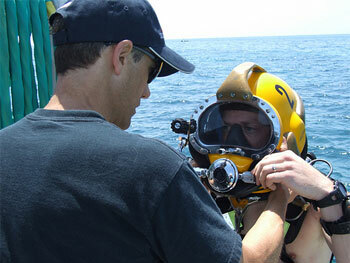 Chris looks over Steve’s helmet connections to make sure that everything will work when Steve is underwater. 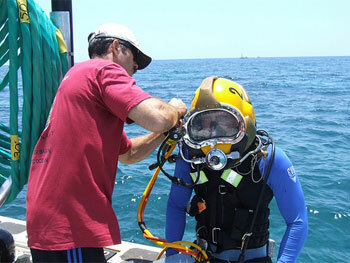 Tom makes sure that Andrew’s helmet is ready for the dive. The Superlite helmet fits very tight to your head and has a mask that fits over your nose and mouth. The helmet allows you to breathe normally underwater and has a full communications system so that you can talk back and forth with your dive buddy. 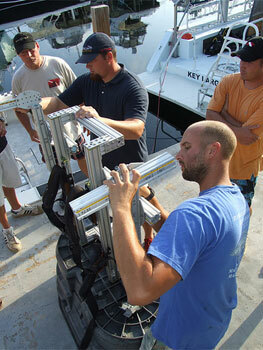 Topside, our team of NURC divers and mission support divers were taught how to move the arms and weights on the center of gravity (CG) rig. This is the equipment that the Aquanauts will wear during several of their EVAs, as they test how changing the location of weights on your back changes how you move. 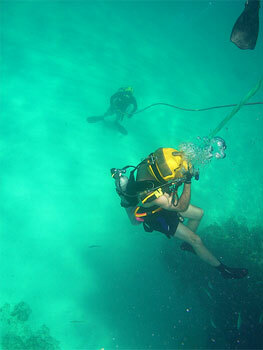 In the afternoon, a crew of divers went out to the dive site to set up the “circuit,” which is basically an underwater obstacle course where the crew will do things like kneel, pick up and move rocks, shovel, and do other tasks that NASA envisions that crewmembers will have to do on surface exploration missions. This is the CG rig that the Aquanauts will wear while evaluating how changing the location of weights on your back alters how you move. The NURC divers are learning how to move the arms of the CG rig up and down to change where the weights will be placed during underwater testing. It was a beautiful day for diving… the water was calm, the visibility was amazing, and the crew successfully completed their Superlite checkout dives! Hi, Heather. It is great for me to be able to see what is going on since I retired. Way to go guys an gals. NEEMO is an awesome project. Hey there Chris! The students and teachers at Pearl Hall Elementary in South Houston wish you and the NEEMO XIV crew all the best as you near your “launch” day. Looking forward to the adventures. Dive safe & we’ll talk to you soon. 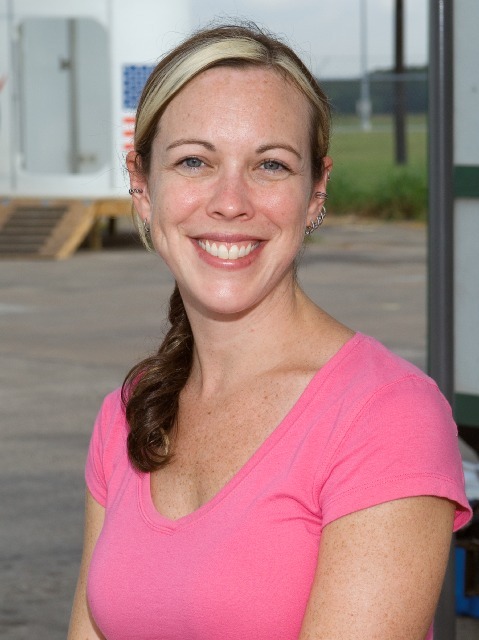 all the best heather paul! !